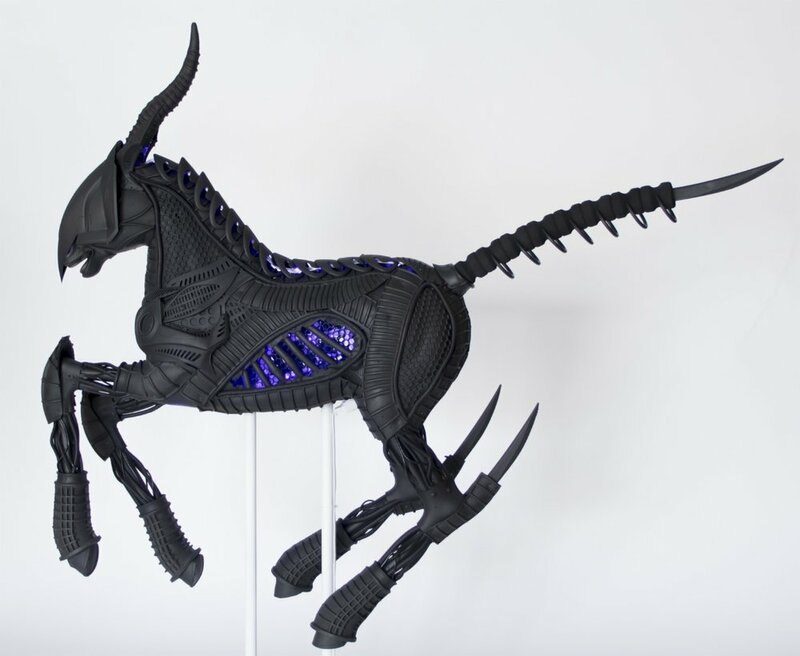 This horse sculpture is like something out of a nightmare we wouldn't mind having. Raven Gleason brings the monsters and aliens of his imagination to life through sculpture and painting, creating what he calls "Beautiful Darkness." The macabre artist draws from a variety of sources, from science fiction to horror to heavy metal. "Science fiction and horror had always been an escape and inspiration for my art when I was younger," Raven told us. "Then music and women became even more inspiration later on." Raven has an intuitive style that means he picks up different mediums according to his whims. "My mediums seem to choose me," he said. "I do not limit myself to one type of art, I just see something and decide that maybe I should try that." "I love sculptures and other larger pieces," he continued. "I also like darker art that fringes on taboo, but I keep an open mind to all art." The Minneapolis-based artist's favorite paranormal subjects are demons and exorcisms, but luckily he hasn't experienced much of that; although he has had his share of otherworldly experiences. "I have lived in many places where I can feel the presence of former owners' pets, and once saw an older gentleman sitting in a chair," said Raven of his brushes with the supernatural. But when it comes to representing these subjects in his art Raven does it "because the unknown and unexplained things are the building blocks to unlock other ways of looking at reality as we know it." "They scare us," he said. "And they're cool as Hell." Raven is nothing if not modest, and might be the most laid-back artist we've featured yet. "I'm not sure what's in store for my sculptures. I guess I would like to display them somewhere that more art lover's can appreciate them," he said. We can't imagine finding a home for this dark beauty would be very difficult. "Be humble, be open minded, get out there and meet other artists," he said when asked to give advice to new artists. "We were all shy once, you'll get over it." Raven certainly is appreciative of the friends he's made, and with his talent and attitude, we imagine he makes them easily. "I would just like to say thanks to my artist friends that encouraged me to do this, and thank you to the Singular Fortean Society for having me as an artist of the month," he said. "I am humbled and appreciative for the opportunity." The pleasure, we have to say, has been ours. You can find Raven on Facebook under Raven Gleason or follow him on Instagram @skullrave.